DID YOU KNOW… Termites cause more damage then Earthquakes, Tornados and Fires combined? Termites are very destructive pests chewing their way through our homes causing billions of dollars of damage per year. Termites feed on cellulose which is the main component in wood. They eat the wood and then break it down with micro bacteria in their stomach. When termite colonies reach a certain size you may find a swarm. Termite swarm season begins in the spring of the year when temperatures reach somewhere around 80 degrees Fahrenheit and 80% humidity typically after a rain. We call it the 80/80 rule. The purpose of a termite swarm is so they can start a new colony. When a termite colony matures it will begin to produce winged reproductive termites whose purpose is to reproduce and create a new colony. The female member in the partnership becomes the queen on the new colony they create. She will lay her fertilized eggs and they will hatch becoming the workers of the colony. Some of the eggs will become soldiers who will protect the colony and the queen. Over the queens lifetime she can lay over 1 million eggs! You may find swarming termites in and around your house. 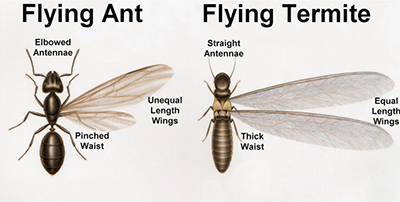 They look very similar to flying ants but they have very distinct differences. Termite have a solid body vs Ants have a separate abdomen and thorax. Termites have 4 wings all of equal lengths. Ants fore wings are longer then their hind wings. Termites antennae are straight and Ants have elbowed antennae. 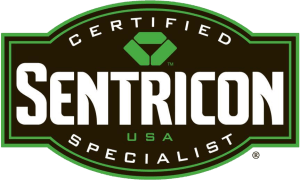 If you have any questions about termites or would like a free inspection please give us a call to schedule. Carpenter Ants Waco Texas What Makes A Particular House Attractive To Destructive Termites?